Ready for saucing and pie! For the first time in 13 years, I have a bumper crop of usable Haralson apples off the tree in my yard. I credit it to good luck, the University of Minnesota and lots of bees. Here’s the story. I’ve had two apple trees in my yard for 13 years (the Haralson and a Connell Red) and I’ve barely harvested a fruit from them in all that time. I’ve never wanted to go through the bother and risk associated with spraying apples and haven’t had the get-up-and-go to put little bags around each apple I wanted to harvest. I like the look of apple trees and I’d resigned myself to finding a few decent apples and giving the rest up to the maggots and the worms. I’ve read a bit more about apples in the last year or so, and last fall I decided to at least get serious about sanitation around my trees. 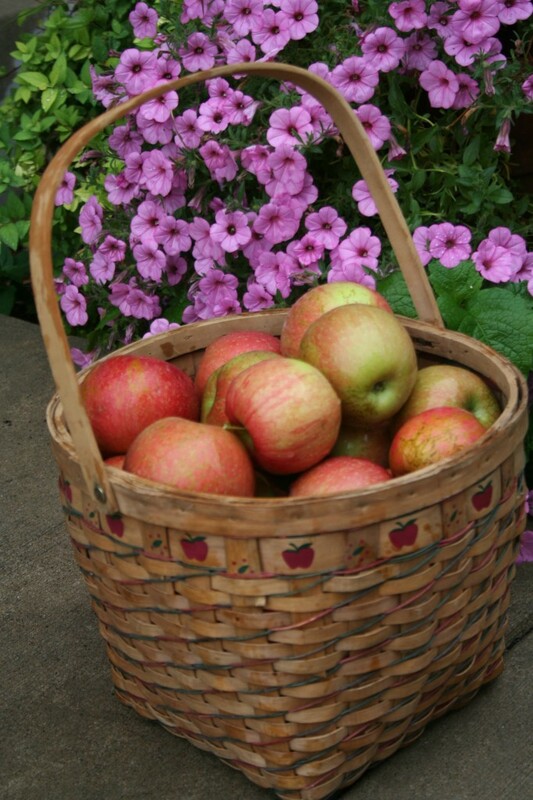 I picked up as many of the crappy apples that fell in autumn as I could in an effort to reduce pests, which tend to overwinter in the soil. Last year and again this spring, I also participated in a University of Minnesota research project to track the arrival of the spotted wing drosophila in Minnesota. The project involves setting out traps — a plastic jar baited with apple cider vinegar and a sticky paper — to catch the bugs. This year, I set the trap in the Haralson tree. The tree is loaded with fruit this year. 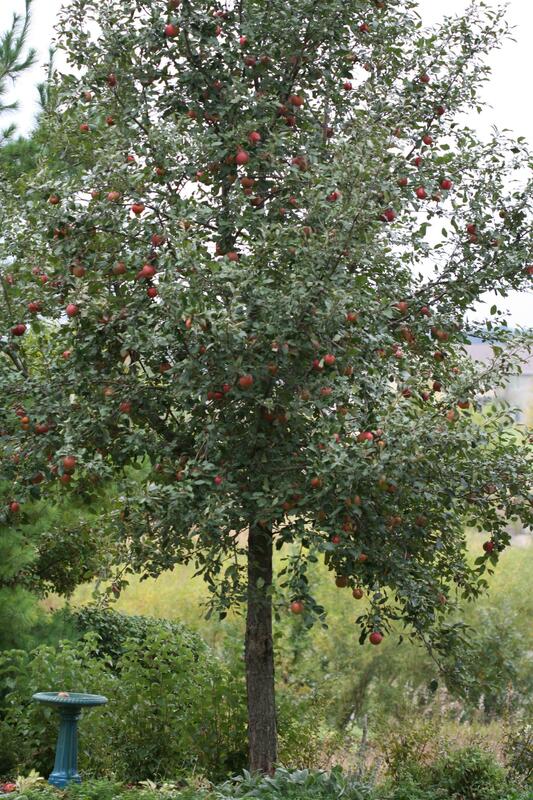 About midway through the summer, I noticed a lot more apples — and I mean, a LOT more apples on the Haralson tree. (The other tree looked like it always did.) Later in the summer, I noticed that not only were there a lot more apples, but many of them (not all, of course, but enough) looked good. No signs of maggot damage or worm holes. Oddly, the good-looking apples concerned me more than the lousy looking ones. (It’s all a game of expectations.) Were they safe to eat??? I hadn’t sprayed and I hadn’t bagged and I hadn’t even put out the traps that are recommended for apple growing in Minnesota. After consulting a variety of web sources that basically said, if there are no visible signs of damage, they are OK to eat, I decided I needed a human to confirm that. I had some pots to return to Knecht’s Nursery in town from three shrubs I’d planted recently, so while there I asked Heidi about the apple situation. She confirmed that yes, bad apples would be showing their badness by this time of year, so anything that looked OK was OK. They are not perfect, but lots of decent apples here. She also offered an interesting hypothesis about why I have so many apples. Heidi’s theory is that the apple cider vinegar traps I had in the tree this spring not only attracted the spotted wing drosophila bugs, they also attracted bees. “You probably finally got good pollination on the tree,” she said. With good pollination came the bigger crop — plenty for the worms and plenty left over for me. This past weekend was the first of what I expect will be a few weekends of canning applesauce, making apple butter and baking apple pies. Next year, I plan to try the same system. 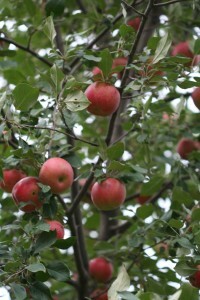 I’ll be cleaning up the area around my tree extra thoroughly this fall, then setting out an apple cider trap next year. We’ll see then if this was a fluke or simple way to get more, better apples. 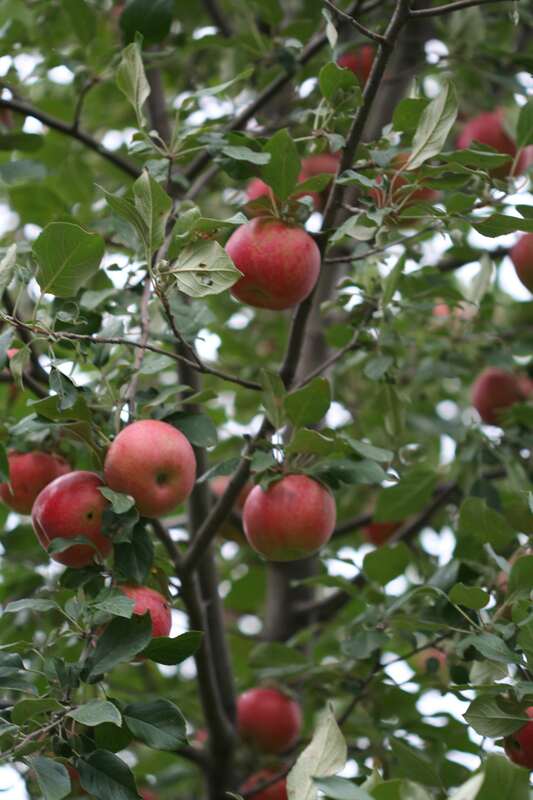 How was your apple crop this year? This is so interesting! Congrats on getting a good crop of apples. Are apples with some damage really unsafe to eat? Do you have any information about this? Thanks for sharing what happened this year. I might try your new system next year. Gardening is such an amazing process of experimentation and sometimes just plain good luck. Becky — Thanks for commenting. Most of the sources I’ve seen recommend cutting off any bad parts and using those apples in cooked purposes only. We have a lot of critters around my area, so I’m a little wary of apples that have been on the ground.